Previously known as the S1, Tablet S is a 9.4-inch Honeycomb 3.1 tablet that comes in the normal 16GB and 32GB variants, along with the dual-core Tegra 2 processor clocked at 1GHz under the hood. Around the outside of this wedge-shaped handheld you'll find a full size SD card reader, and five megapixel rear shooter. The S is set to hit the streets in a few weeks for $499 and $599, depending model. The clamshell S2 has taken on the name Tablet P, presumably for its Playstation-centric nature, rocks two 5.5 inch displays at 1024x800, a 1Ghz Tegra 2 processor, 5MP and VGA front and rear cameras, 4GB of storage, SD card slot, and a microUSB port. The P will also run on AT&T's network, but no word of pricing or availability just yet. Sony laid the cross device connectivity on pretty heavy, as both devices are made to interact, control, and otherwise manipulate other Sony devices, such as Bravia HDTVs, via infared. SAN DIEGO, Aug. 31, 2011 /PRNewswire/ -- Sony today announced the market launch of its first two Sony Tablet™ devices. The Android-powered Sony Tablet S and Sony Tablet P devices combine unique hardware, content and network services with seamless usability to create a world of engaging networked entertainment experiences. Available for pre-sale today and on shelves next month, the Sony Tablet S device is optimized for rich media entertainment on its 9.4-inch touchscreen display. With a powerful NVIDIA® Tegra™ 2 mobile processor, the Sony Tablet S device lets you enjoy the web as well as your favorite content and applications on its large, high-resolution screen. Weighing in at just about 1.33 lbs., its unique asymmetric design allows for hours of comfortable use and built-in Wi-Fi® compatibility means Internet connectivity virtually anywhere there's a hotspot. Available later this year, the Sony Tablet P device is ideal for mobile communication and entertainment. With its innovative folding design, two 5.5-inch displays and weight at about 0.83 lbs., it can easily fit into a pocket, purse or backpack. It features the same NVIDIA® Tegra™ 2 mobile processor and is both Wi-Fi compatible and 4G capable exclusively on AT&T's mobile broadband network,(1) offering users access to digital content including videos, games, and e-mail, while on the go, nearly anytime. Both devices run on Android, Android 3.1 on Sony Tablet S devices(2) and Sony Tablet P devices will be equipped with Android 3.2 by the time they ship. Both models feature front and rear facing cameras that allow for video recording and capturing still images. The devices also support micro USB interface and SD card. Sony Tablet devices are also distinguished by four key features that set them apart from any other tablets on the market. These include: optimally designed hardware and software, a "swift and smooth" experience, network entertainment services and cross-device functionality. "These devices truly represent the best of everything Sony has to offer," said Mike Lucas, senior vice president of Sony Electronics' Networked Technology and Services Division. "From hardware to software and services, Sony Tablet devices embody all our innovations rolled into one." Unlike other tablet devices, Sony Tablet S device has an ergonomic, asymmetric design which allows it to be easily held or carried for long periods of time. The unique form factor shifts the device's weight closer to your palm, making it feel lighter and more comfortable while reading an e-book or watching a video. The screen is sloped when placed on a flat surface, enhancing visibility and making typing more comfortable. Placing a Sony Tablet S device onto a specialized charging cradle (sold separately) converts the device into a digital photo frame, a digital clock that displays customizable information or chumby with access to over 1,500 fun and entertaining apps. Software taking advantage of the unprecedented design of the Sony Tablet P device allows its dual screens to be used for different functions simultaneously such as playing video on one screen while using the other as a controller or reading email on one screen while using the other as a virtual keyboard. The displays can also be combined to form a single large screen for Internet browsing and more. By holding the device vertically, you can also read eBooks much in the same manner you would a physical book. Both Sony Tablet devices are equipped with Sony's TruBlack™ displays which reduce reflection and glare from sunlight or fluorescent light for high-contrast visibility both indoors and out. 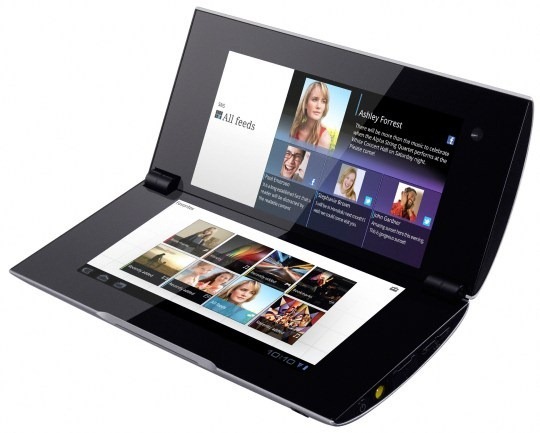 Both Sony Tablet devices come complete with access to a full suite of Sony's network entertainment services. Sony Entertainment Network services: Video Unlimited is your ticket to the latest releases from every major movie studio to rent or own. A pre-open campaign for the Sony Tablet devices will be offered at device launch with limited content and more content will continue to be released over time. Music Unlimited, available in October, offers instant access to a global catalog of over 10 million songs from every major record label (numbers vary by country). Simply sync to the cloud and enjoy the music you love on Sony Tablet devices or any other Internet-enabled Sony device. A six month trial basic membership from Music Unlimited and a free movie download from Video Unlimited come with the purchase of each device. PlayStation® Certified: Sony Tablet devices are the first PlayStation® Certified tablets that provide out-of-the-box gaming with included favorites "Crash Bandicoot" and "Pinball Heroes." Reader™ Store: Access bestsellers, new releases, classics, magazines and more from more than 2.5 million titles at Reader™ Store by Sony. The store's intuitive reading interface is ideal for on-the-go reading, allowing book lovers to set bookmarks, make highlights and adjust font sizes as they read. A free eBook download is included with the purchase of the device. Personal Space™ by Sony: This free service allows you to easily share pictures and videos captured on Sony Tablet devices. You can also access albums that were previously uploaded from other devices. Video, music, games and other content can be directly accessed by way of the "Favorites" menu without the need to re-launch any of the respective applications. Control your home entertainment system and enjoy content in new ways. With Sony Tablet devices, you can "throw" personal pictures and video to DLNA compatible televisions such as BRAVIA® HDTVs with the touch of a button. You can also throw music to compatible wireless speakers such as Sony's HomeShare™ speakers. The Sony Tablet S device, which is equipped with infrared technology, can act as a remote control for multiple home entertainment components such as TVs, Blu-ray Disc™ players, cable and satellite boxes, and more. The built-in Universal remote not only controls your Sony products, but other brands as well. 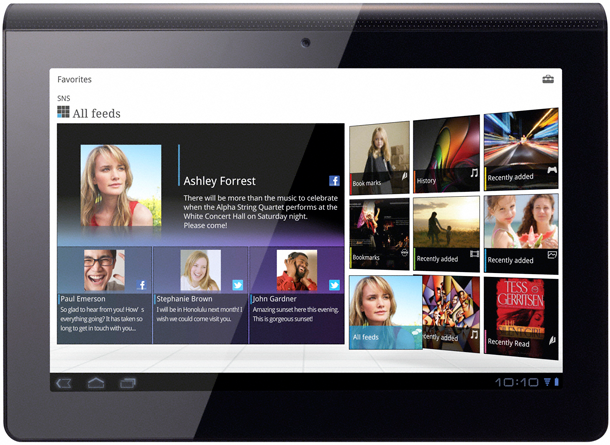 Sony Tablet S device is the world's first Android Tablet running Honeycomb with a built in A/V remote control. Both Sony Tablet devices are compatible with the Media Remote™ app which allows you to control Sony devices, including BRAVIA televisions, through Wi-Fi® technology. A variety of applications add to the entertainment options. With access to the Android Market™, you can browse thousands of useful time-saving and fun apps. Sony Tablet devices also provide instant access to Google™ mobile services and applications, including 3D maps and easy web search with Google Voice Search. To make app discovery even easier, Sony offers its Select App site which highlights new and unique Android applications in a number of categories, recommended for Sony Tablet devices. Recommended applications will be spotlighted at launch with more to come in the following weeks and months. A range of optional accessories includes a cradle, AC adapter, LCD screen protector, carrying case and USB adaptor cable for Sony Tablet S devices, and a rechargeable battery pack, AC adapter, LCD screen protector, carrying case and detachable panels for Sony Tablet P devices. A Bluetooth keyboard is also available for both models. The Sony Tablet S device is available in both a 16 GB and 32 GB version and will be sold at Sony Stores including online and other authorized retailers nationwide for about $499 and $599, respectively. For more information, please visit www.sony.com/tablet or check out www.sony.com/tabletvideo for a video unboxing.